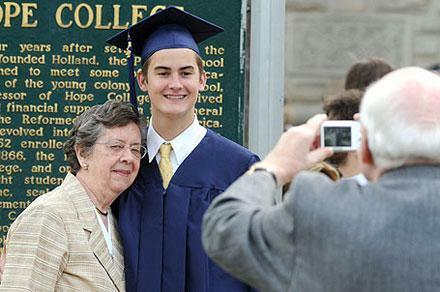 Enjoy photos from the 2012 Baccalaureate Services and Commencement. Approximately 690 graduating seniors participated in this year’s ceremony, the college’s 147th. The class consisted of students from throughout the United States as well as from overseas, including from Armenia, Brazil, China, Kyrgyzstan, Mexico, Palestine, Singapore, South Korea and Thailand. Five Hope College tennis playes have received All-conference honors from the Michigan Intercollegiate Athletic Association (MIAA). The 147th Hope College Commencement address was delivered by Dr. Heather Sellers, professor of English, who presented “And your homework is…” on Sunday, May 6. Dr. Sellers has been a member of the Hope faculty since 1995, and teaches poetry, fiction and creative non-fiction. A nationally acclaimed author, she is also highly regarded as a mentor by her students. In 2011, the graduating class presented her with the “Hope Outstanding Professor Educator” (H.O.P.E.) Award.